Five years ago, Chick-fil-A was in four U.S. airports. By the end of 2017, company officials say they'll have nearly 30 restaurants in more than 25 airports throughout the country and one at Calgary International in Alberta, Canada. To understand the explosive growth, Airport Improvement spoke with executives from the booming restaurant chain, three airports that are adding the brand to their terminals and HMSHost Corp., one of the company's licensees for airports. What started as a single menu item served at a small Georgia diner in 1946 has grown into a thriving family-owned corporation with more than 2,100 locations in 46 states and Washington, D.C. Competition for franchises is fierce, yet the company only requires a $10,000 commitment from franchisees-the lowest in the industry. • Chick-fil-A is the largest purchaser of lemons in the world. In 2015 alone, the chain used almost 297 million making its fresh-squeezed lemonade. • It takes potatoes about 115 days to grow and be cut into waffle fries for the restaurants. • Chick-fil-A Sauce is a blend of honey mustard, barbecue and ranch sauces. • In the first quarter of 2017, HMSHost-operated Chick-fil-A restaurants served more than 385,000 sandwiches, nearly 300,000 breakfast sandwiches and 1.675 million chicken nuggets. The catalyst for all that commercial success? A fried chicken breast topped with two pickles, served on a white, buttered bun. Sean Warren, director of New Restaurant Growth - Licensing for Chick-fil-A, Inc., has spent the majority of his 17 years with the company opening restaurants in non-traditional locations, such as inside hospitals, on college campuses and within corporate environments. Airport locations, like the company's other licensed restaurants, provide customers access to the Chick-fil-A brand in unique environments "where everyday life happens," explains Warren. Airport locations are also helping expand the company's reach to international passengers unfamiliar with its menu, he adds. Tyler Pitman, senior director of Restaurant Development for HMSHost, says that there's no doubt that Chick-fil-A is a well-established, sought-after chain. 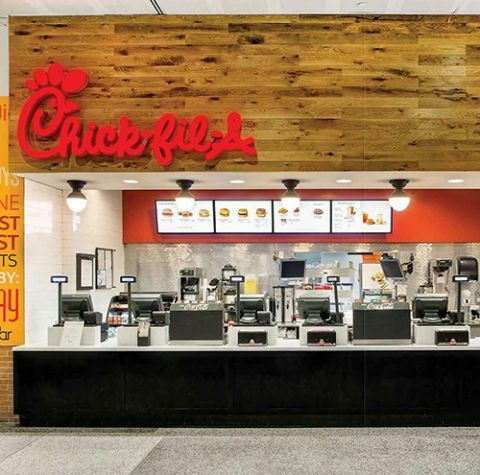 Bringing a brand like it to the airport sector has been exciting and beneficial for the entire industry, as well as for both sides of the HMSHost and Chick-fil-A partnership, he notes. For airports, the appeal seems to center squarely on keeping passengers happy; and Chick-fil-A is what they are asking for. "Quite honestly, over the years we've had numerous requests for Chick-fil-A in our airport," says Haley Gentry, assistant aviation director of business and revenue for Charlotte Douglas International Airport (CLT). "We were planning redevelopment, and HMSHost chose to pursue the chain-very much with our blessing." "It was a no-brainer for us," agrees Bryan Malinowski, deputy executive director for Bill and Hillary Clinton National Airport (LIT) in Little Rock, AR. "That's what our passengers want, and what our community is desiring." Last year, Chick-fil-A nabbed three of 10 slots on the list of Top 10 Restaurants in Little Rock by sales-including No. 1. Carleen Kerr, senior airport properties representative at the Houston Airport System, says the chain's food is great and reasonably priced, but she ranks its customer service as "out of this world." Kerr reports that staff members are polite, greet everyone who walks in the door and are seemingly never in a bad mood-attributes every airport operator would like to see in concessions workers. As a self-proclaimed "Chick-fil-A person" herself, Kerr often tells peers at other airports that if they don't have Chick-fil-A, they need to get one. Houston Airport System, in fact, has three. "Not only do they do good sales and drive great traffic, but everybody knows the brand and enjoys the quality food," Kerr explains. Gentry reports that at CLT, the restaurant's speedy service and high-quality food appeal to passengers making tight connections. Malinowski agrees, noting that employees at LIT couldn't be more excited to be getting a location next year. 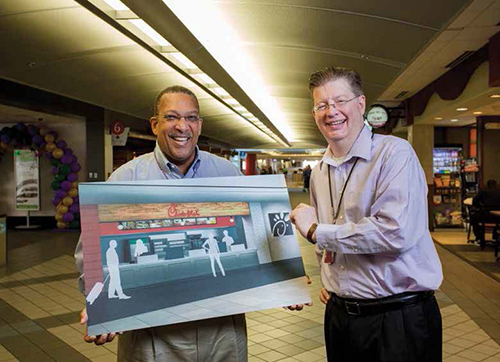 He and his team worked with HMSHost to bring Chick-fil-A to the single-concourse national airport because they believe customers want a menu they know inside and out. Malinowski says that passengers like a mix of options when traveling, including healthy selection; so that's what he tries to offer at LIT. When Chick-fil-A founder Truett Cathy opened his first restaurant seven decades ago, he closed the diner on Sundays to give employees a day to rest, spend time with family and friends, and worship if they desired. Today, all Chick-fil-A locations are required to follow the same six-day schedule. Interestingly, the policy doesn't seem to be a deal-breaker for airports "We knew what we were getting upfront," says Kerr. "It wasn't an issue. They are still busy at both airports." The company's schedule was also a moot point at CLT. "Quite frankly, it comes right down to sheer dollars," explains Gentry. "Their operating and revenue performance are considerably higher than most concepts we could have put in that space. They're going to make the revenue in six days that some of our units don't make in seven." "Truett Cathy made that decision when he opened his first restaurant, and we are honored to continue it after all these years," Warren remarks. Many involved with the company say that the bottom line is a focus on great food, exceptional hospitality and creating remarkable experiences for customers. Recent growth in the airport sector is a testament that the model continues to thrive, notes Warren. "It's not a fad," insists Malinowski. "In Little Rock, every time I pass one, there is a drive-thru line wrapped around the building." Scheduled to open this summer, CLT's Chick-fil-A is currently under construction in the airport's atrium-a strategic location to be sure, notes Gentry. The airport also chose the site to provide additional square footage for its new tenant. "We think this is going to be one of our strongest economic producers," says Gentry. "We also think it's going to have a significant employee following because of the [moderate] price point. We know we'll be meeting customer demand, too." Warren explains that Chick-fil-A selects the airport locations for its licensed restaurants based on the company's overall growth strategy and where it wants to complement street locations. Determining locations within airports is based on an individual airport's growth plans and customer traffic, but each location is given an opportunity on its own merit. There is no set preference to a certain terminal or location, says Warren. Houston's William P. Hobby Airport (HOU), which uses a consultant to help determine concessions placement, located Chick-fil-A in its new international concourse, which has a swing gate to allow both domestic and international flights. Bush Intercontinental Airport has two locations-one in Terminal A and another in Terminal B. Kerr reports that both are always busy, and everyone knows about Chick-fil-A. "If they don't, they find it," she laughs. These days, boneless chicken sandwiches are ubiquitous. But when Chick-fi-A introduced the first quick-service chicken sandwich in 1964, it was a novelty. The capital "A" was added to the name to denote top-quality, or Grade A, food. "Passengers know exactly what they are getting," says Malinowski of Chick-fil-A's menu items. This is especially important in airports because customers don't have time to leave meals to chance, he explains. Like customers, Warren says that airport executives appreciate Chick-fil-A's reputation for serving quality food. "Our food is prepared fresh in the restaurants every day," he explains. "Our chicken is hand-breaded, salads are freshly cut, and lemons are freshly squeezed. That happens in our traditional street restaurants, and the exact same processes apply in the airport locations." Consistency is key, he adds. While airport locations may streamline the menu, the service, quality and taste will be what passengers expect from Chick-fil-A, emphasizes Warren. Gentry likes that the restaurant's menu covers the entire day-a must for CLT's long hours. She also appreciates that Chick-fil-A can accommodate customers with eating challenges such as Celiac Disease or gluten intolerance. "If you ever want a good french fry, they are your place to eat if you eat gluten-free," she raves. Gentry also notes that the restaurant has dedicated fryers for its waffle fries, as well as grilled chicken salads and excellent offerings for children. "They do have a cult following," she observes, noting that the company's customer devotion was part of the charm for CLT management. In summary, airports seem to be drawn to Chick-fil-A because of its popularity with passengers, mannerly service and affordable, predictable food. It may have started as a piece of Southern pop culture, but the iconic chain seems to be just what passengers are hoping to find at airports nationwide.